Running through the month of June at the Elsinore Gallery in downtown Salem, will be the exhibition titled Nature in Miniature showcasing 60 small works from artists around the country. The opening reception will be held at the gallery on June 2 (this Saturday) from 3-5pm at 142 High Street. Peter will be showing three of his paintings including The Future (above) which depicts a young male lion cub contentedly looking over his mothers back. Inspiration has been known to hit me at the weirdest times. 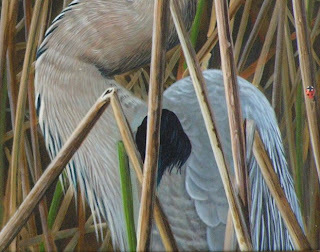 For example, with my painting 'Heron Hideaway' - I thought I was finished with the painting. It was varnished, nicely framed and ready to hang at the Peppertree Art Show. However, while driving to the show to drop off my paintings, a sudden idea popped into my head. The painting needed a ladybug in the reeds. It would add a little splash of color and a little more interest to the piece. 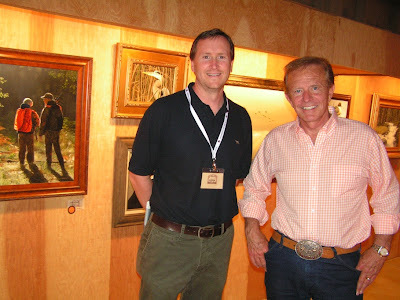 The painting was supposed to be dropped off Monday morning at the Peppertree Ranch the week before the show opened. 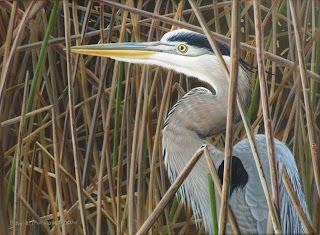 While Sherrie (who helps run the show) and artist George Lockwood looked over my art and entered them into the inventory list I casually mentioned that I would like to add a ladybug to the heron painting. Their faces lit up and they both thought it was a great idea with George even offering his studio and supplies for me to paint one. I did bring my painting stuff though, and I went back to my brother and sister-in-law's house, sat at their backyard table in the beautiful southern California sun and added a ladybug to the painting. The painting was back to the ranch in time for hanging later that day and to complete the process, George went over the fresh paint with a little varnish. 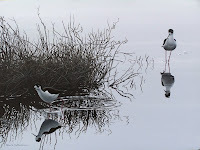 I decided to add the insect to the far left side of the image out of conflict with the heron. The viewer's eye is eventually led to the ladybug and it becomes a nice surprise in the painting. It is widely known among wildlife artists who submit to Birds in Art, the premiere avian art exhibition in the world, that if you receive the small notification envelope in the mail, the news generally isn't good. However, if you get the big envelope, there is cause for celebration. Today, I got the big envelope in the mail!! The painting "Reflections" (pictured) will be exhibited September 8 - November 11 at the Leigh Yawkee Woodson Art Museum in Wausau, WI. 95 artists from numerous countries throughout the world will participate in the upcoming exhibition. 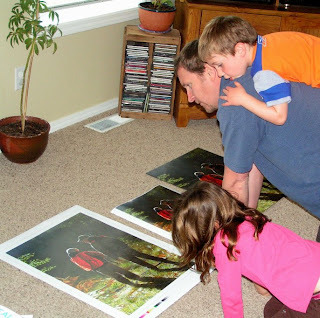 Here is a picture of me and "my staff" checking over proofs of the new print. This is a continuation of the Earth Day post below. As promised, a photo of setting up my artwork. My posts have gotten a little sparse because I am trying to get some paintings finished up before traveling to CA next week. Next week? Aaahh!!! It's May and I am painting like a madman before leaving for the Peppertree Art Show in California in a couple of weeks. 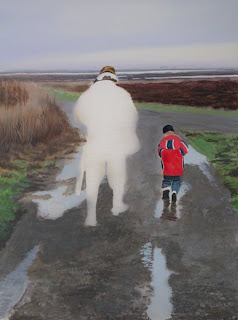 The above painting is going to be called Generations and is of my dad and my son on his first duck hunting trip. It is based on the same format as the painting Lessons that I did a couple of months back (and posted in this blog). There are a lot of special moments in life and hunting with my dad has provided many of them.